Hello, all. It's January 3, 2012 and the New Year is humming along. We have had snow for the last two days so I guess winter, which was late arriving, is here to stay. As the New Year arrives, most of us spend some time thinking about resolutions and to-do lists that can make our lives better. One suggestion I have written about recently was to post a resolution at a website dedicated to having people commit to doing more volunteer work on any scale that suits them. Resolution12 suggests we write our resolution down for all to see and that may help us to get it done. Like you I have been thinking about doing more volunteer work. Right before Christmas my husband and son and I were happy to be asked to help with the local Toys for Tots program. As you know the annual program is sponsored by the United States Marine Corps and provides toys to children who otherwise might not receive anything under the tree. We worked several jobs at the chilly warehouse during our volunteer hours that Saturday, not really feeling the cold because of all of the warm hearts we worked alongside. 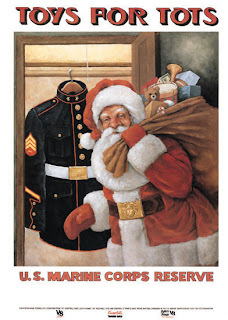 One job in particular required taking a slip of paper with the genders and ages of a family's children marked off and "shop" for toys for those children/ We then placed the toys in a bag to hand to a Marine who handed the bag to a family member. Mothers, fathers, friends and small children did the shopping and truly, there were no complaints from any one of any age while doing the fast-paced work. Performing that volunteer work made me feel that there is so much more to be done and that we Baby Boomers often have some extra time to do those jobs. I hope you will find time this year to volunteer and offer the world your talents and love. It's waiting.